I was back in Toulouse, about a year to date after my last visit to the A380 final assembly line. Besides getting to know the amazing Beluga aircraft, I got to know a few aspects of the A380 programme that escaped me last time. A visit to the A380 assembly line was, of course, "de rigueur", but this time I could see some other areas of Airbus' Blagnac site that fulfill an important role when it comes to getting the aircraft ready for delivery to airlines. Most passenger might not give a conscious thought to it, but the look of the cabin and the atmosphere you perceive when you get on board of an airliner are the result of the work being done here. This aircraft mock-up is used to test new cabin decor ideas. Here is where, together with its airline customers, Airbus prepares the next generation of the air passenger's experience. Despite the aircraft mock-up, this facility looks more like a fashion workshop or a design studio. Here Airbus creative types come up with and test new ideas for aircraft interiors. Much larger than the design center, the state-of-the-art mock-up center right next to Airbus corporate offices is quite an impressive building. The purpose of this facility is to showcase different configurations that can fit into each of Airbus' aircraft types. There is proper real-size mock up of each of Airbus' airframes, each with a range of seat plan configurations and interiors. 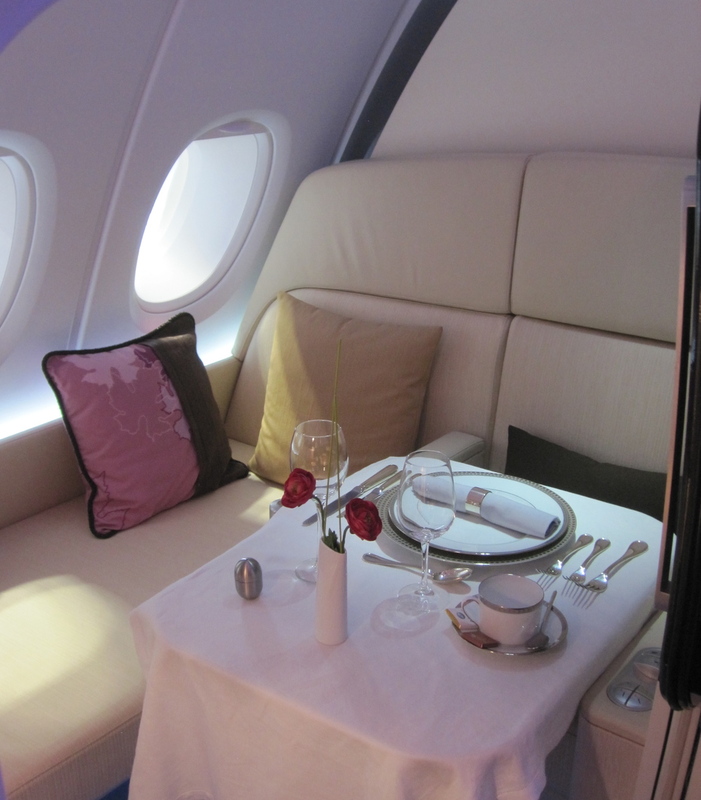 We were given a tour of the A380 mock-up and got impressed by some of the very luxurious options available. Ready to order some food?